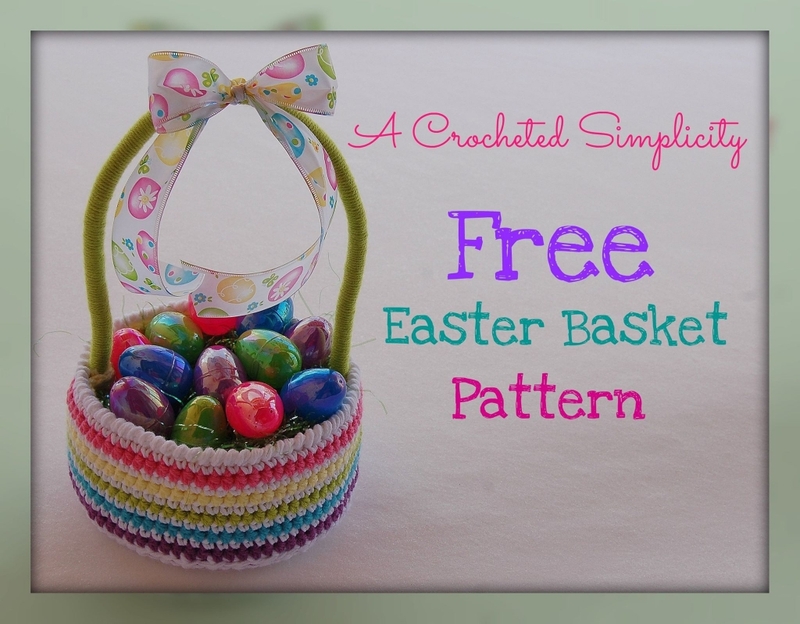 The Easy Easter Basket is a great basket when crocheted as shown, or use the pattern as a base and let your creative juices flow to create your own personalized Easter basket! Yarn: Worsted Weight yarn (the yarn picture in the photos is Red Heart Super Saver ) You’ll need 1 skein (approximately 230 yards) of your Main Color and minimal amounts (approximately 40 yards) of any Contrasting Colors you choose (the color you choose for a liner will need a little more). Beginning chains are not counted as stitches or included in stitch counts. The entire basket is worked holding 2 strands of yarn together and working them as 1 strand. Color Changes: Change colors on the last pull thru of the last stitch of the round before joining. Reverse Single Crochet (revsc): This stitch is worked from left to right. 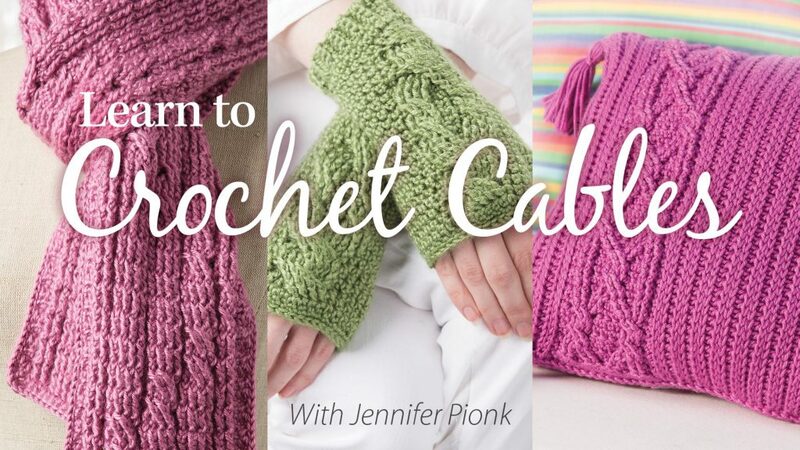 With the right side of the work facing you, working left to right, insert hook in next stitch to the right, yo, pull up a loop, yo and draw yarn through 2 loops on your hook = 1 rev sc. Circular Bottom (Make 2): You may choose to make only 1. I prefer 2 for the added strength in the bottom of the bag. See photos below for assembly & additional options. Yarn: The entire basket is worked holding 2 strands of yarn together as one. Circular bottoms are worked using your MC. Fasten off. Weave in ends. Continue below to Circular Base Options & Assembly. There are 3 Options for the bottom of the basket. Option #1: Using only 1 circle for the bottom of your basket. If you’re choosing to use only 1 circle for the bottom of your basket, you can skip thru the following steps and move on to the “Side of the Basket”. 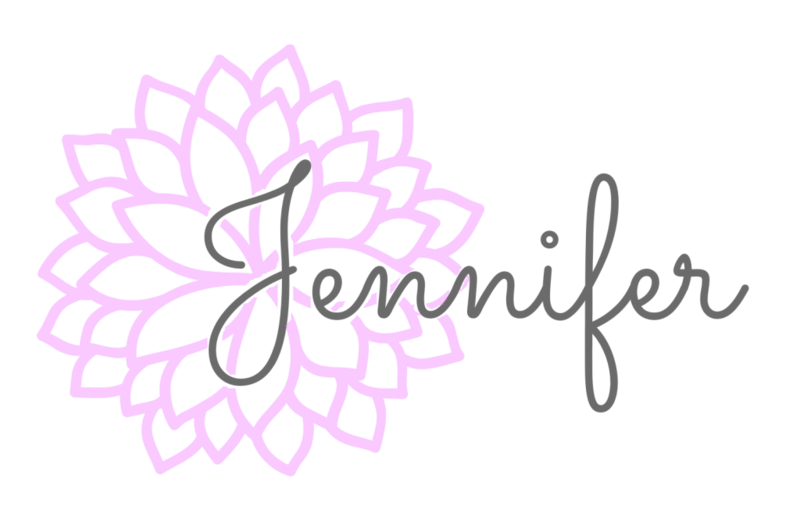 Option #2: Using 2 circles for the bottom of your basket without plastic canvas in between the circles. If you choose to use 2 circles for the bottom of your basket, but do not want to add plastic canvas, then you may skip steps 1 thru 4 below and continue with step 5. 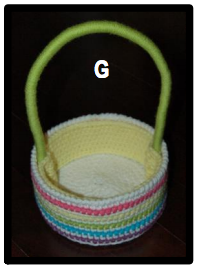 Option #3: Using 2 circles for the bottom of your basket and putting plastic canvas in between them. If you are choosing this option, follow steps 1 thru 5 below. Step 1: See Photo A. Lay 1 of your completed circles on top of a sheet of plastic canvas. Step 2: See Photo B. Using a marker, carefully trace around the edge of your circle. Do not worry about getting too close to your edge, you’ll see why in the next photo. Step 3: See Photo C. Cut out your circle by cutting 1/4″ to 3/8″ on the Inside of your trace marks. Step 4: See Photos D & E. Lay your plastic canvas circle on top of 1 of your crocheted circles. 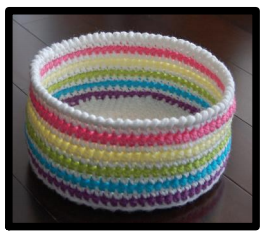 Lay your 2nd crocheted circle on top of the plastic canvas. Step 5: See Photo F. Using a yarn needle and length of yarn, sew the 2 circles together. Note: Changes for the different size baskets will be noted as follows: 7″ (8″, 9″). Round 2: (MC) Ch 1, sc in the same st as ch-1, sc in each st around. Join. Round 3: (AC) Ch 1, hdc in the same st as ch-1, hdc in each st around. Join. Round 4: (MC) Rep Round 2. Round 5: (AC) Rep Round 3. Round 6: (MC) Rep Round 2. Round 7: (AC) Rep Round 3. Round 8: (MC) Rep Round 2. Round 9: (AC) Rep Round 3. Round 10: (MC) Rep Round 2. Round 11: (MC) Ch 1, revsc in each st around. Join. Fasten off. Weave in ends. Continue on to the Liner. Round 2: Ch 1, hdc in the same st as ch-1, hdc in each st around. Join. Round 7: Ch 1, sc in the same st as ch-1, sc in each st around. Join. Fasten off. Use the Invisible Join Technique. Using the tail from the beginning foundation ch and a yarn needle, whipstitch the small gap together between the 1st and last sts of Round 1. Weave in ends. Continue on to Reinforcing the Side of the Basket. Step 1: See Photo A. Cut (2) 3-1/4″ X 13-1/2″ rectangles of plastic canvas. Step 2: See Photo B. Position the rectangles on the inside of the basket as shown. I overlap mine by 3 small squares. Mark your cut, if needed. Remove rectangles and trim ends to fit, if needed. Step 3: See Photo C. Using a needle and thread or yarn, sew the ends of the rectangles together. Make sure to overlap the same distance as you used when measuring in step 2. Continue on to Constructing the Handle & Assembly. Step 1: See Photo A. After you’ve cut your cotton piping/cording to the suggested length from the previous page, attach 2 strands of yarn near one end of it by tying the yarn in a knot. Step 2: See Photo B. Keeping your yarn from twisting, wrap it around your cotton piping/cording until you have about 1-1/2″ remaining. Make sure to wrap your yarn close together so you do not have gaps showing your piping/cording. Knot yarn to fasten so that it won’t slip off. Step 3: See Photo C. Shows your completely wrapped handle. Step 5: See Photo E. Using a yarn needle and 2 strands of yarn, in the same color as your liner, attach the handle to the liner by sewing around it and thru the liner. Continue to sew the length of the liner. 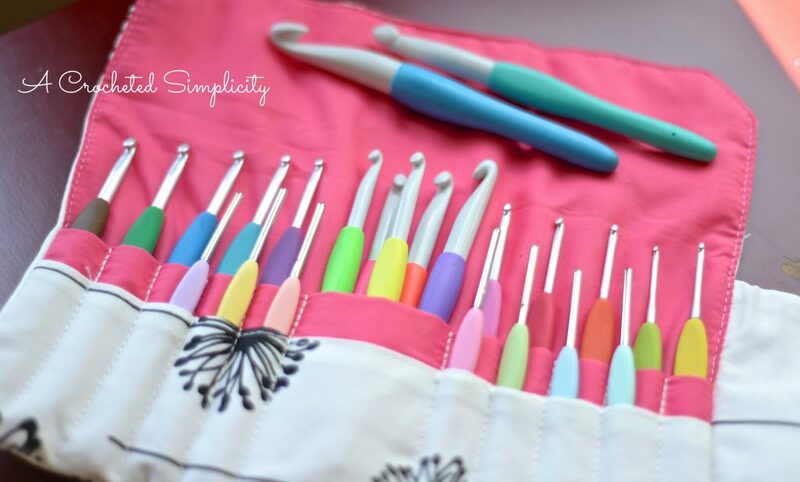 Sew your liner into your basket using a length of yarn and yarn needle. Sew around the top edge weaving in and out of every stitch around. Sew around the bottom edge the same way. Weave in ends.